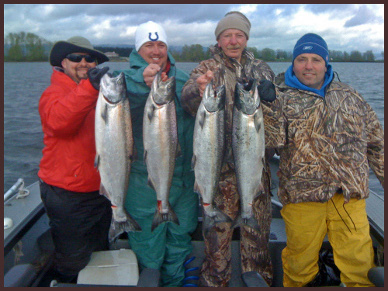 Spring chinook salmon fishing has been excellent so far this year on the Columbia River. Almost a half million Columbia upriver springers are predicted by Oregon’s Dept. of Fish & Wildlife to return in 2010. The season started off in February with unseasonably warm weather and plenty of fish to go around. As the season heats up catch rates are expected to go even higher with the bulk of the run still yet to come. You are currently browsing the Sky's Guide – Pacific Northwest & Oregon Guided Fishing Trips | Salmon Fishing, Steelhead Fishing, & Sturgeon Fishing blog archives for April, 2010. We'd love to hear your fishing stories. If chosen, we'll feature your story on Sky's Blog. Contributors must register for an account. To learn more, read the contributor guidelines or contact us. © Copyright 2009 Sky's Guide Service. All Rights Reserved.